Dashing Through The Snow ... With A Reindeer In A Pickup Truck? : The Picture Show NPR photographer David Gilkey provides a dispatch from Nome, Alaska — where spotting a reindeer in a pickup is one of the perks of the job. 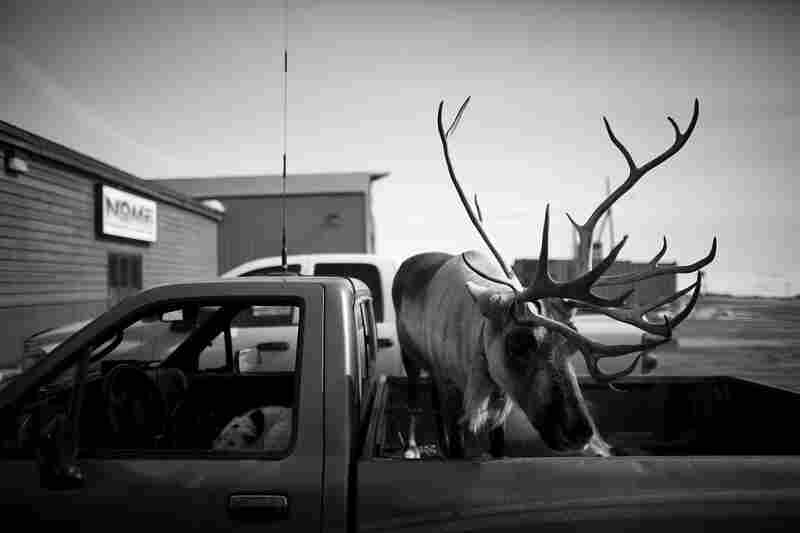 "Velvet Eyes" — a pet reindeer belonging to Carl Emmons — stands in the back of a pickup truck outside a market and gas station in Nome, Alaska. Velvet Eyes stands in the back of Carl Emmons' pickup truck, while a dog keeps watch in the front seat, in Nome, Alaska. As a photographer working for NPR, I travel the globe covering assignments with our reporters and correspondents. The logistics of getting into a place can be brutal, and rarely do photographs "just happen" without a tremendous amount of time and effort. On a recent trip to Nome, Alaska, NPR correspondent Quil Lawrence and I were covering the challenges veterans face getting care and services in remote places. We also wanted to capture the sense of extreme remoteness. So that's what we were looking for, driving through town along the Bering Strait, with the winter ice breaking up next to the main drag of saloons, restaurants and little hotels. I was driving, paying attention to the road, when Quil turned and asked if I had seen "that." In a tone of amazement, he said he had seen a pickup truck drive down a side street with a reindeer in the back. I figured it was worth further investigation, so we turned around. No sooner had we gone around the block when there, amid a row of parked trucks at the local market, was a pickup holding a huge live reindeer. Quil and I jumped out to get a closer look, and quickly surmised that this was not an animal on the way to the slaughterhouse, but a household pet. 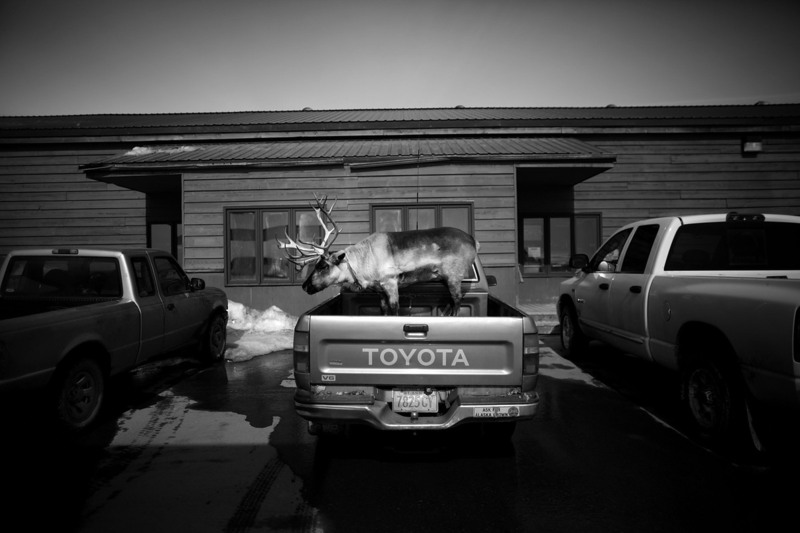 We've all seen dogs patiently waiting in parked cars for their owners; in Nome, just replace the dog with a reindeer. We chatted with the owner, Carl Emmons, who informed us that the reindeer — named "Velvet Eyes" — is 12 years old, and that he had raised her since she was a fawn. She is Nome's most famous domesticated reindeer and has a penchant for blueberry pancakes. I am convinced Carl pulled away wondering what the hell was wrong with me and Quil — and why we would think Velvet Eyes such an odd pet. "Normal" always depends upon where one is standing. David Gilkey is a staff photographer for NPR, currently on assignment in Afghanistan. Quil Lawrence is a correspondent for NPR, currently covering veterans affairs.